Ali Lohan New Face: Mystery Solved? 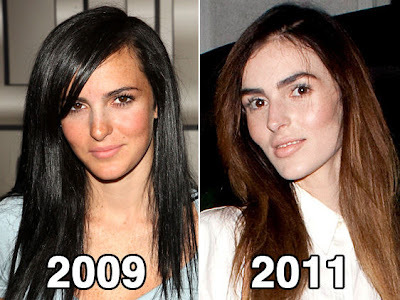 A recent snapshot of young aspiring model, Ali Lohan, has sent the internet into a trending frenzy, with plastic surgery being the early conclusion in public opinion. The madness began last week when a photograph reveled a drastically altered looking Lohan, sporting a more chiseled and sculpted looking face. "Her success as a model lies with her natural looks and she has no interest in changing that. During the past two years, she has gone through a normal teenage growth spurt that has made her taller and slimmer." Ok sure, so she may be more slender, but what about her more sculpted facial appearance? Which is a far cry from her former pictures just two years ago. Is this also the result of a growth spurt? Her growth "has also slightly changed the composure of her face, all of which is typical of what happens to kids in their mid to late teens. It's what most people refer to as the awkward stage. Ali is growing up, that's all" concludes Honig. Very good points indeed, however, we have also seen a variety of young stars grow up without any 'drastic' changes in their appearance. So this case is still very intriguing to us, to say the least. But since her rep was so quick to deny these plastic surgery rumors, leads us to believe that they may be telling the truth. Unlike so many other celebrities who fail to address such speculation. With that being said, this isn't the first time that Ali Lohan has been the subject of cosmetic surgery gossip. Nearly two years ago she was rumored to have had breast implants. A rumor that continues to linger to this very day. Its also worth mentioning that her big sister/role model, Lindsay Lohan, is believed to have dabbled in a bit of plastic surgery as well, perhaps most notably her presumed obsession with lip injections. Feel free to share your thoughts about Ali Lohan and this entire situation, in the comment section below. She looks like a gaunt ghost. Perhaps drugs and alcohol? Eww....how did she go from looking young and beautiful to old and haggard?! That should be a malpractice lawsuit.